River deltas are difficult places for map makers. The river builds them up, the sea wears them down; their outlines are always changing. The changes in China's Pearl River delta, however, are more dramatic than these natural fluctuations. 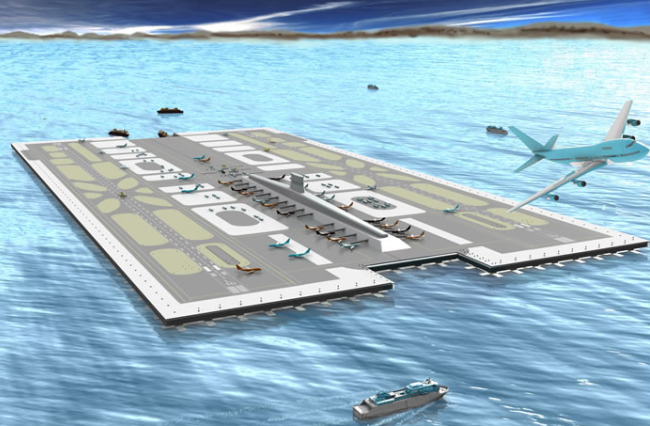 An island six kilometres long and with a total area of 1248 hectares is being created there. And the civil engineers are as interested in performance as in speed and size. This is a bit of the delta that they want to endure. According to Frans Uiterwijk, a Dutchman who is the project's reclamation director, it would have been possible to leave this mud below the reclaimed land, and to deal with the resulting settlement by the Kansai method. But the consortium that won the contract for the island opted for a more aggressive approach. It assembled the worlds largest fleet of dredgers, which sucked up 150m cubic metres of clay and mud and dumped it in deeper waters. At the same time, sand was dredged from the waters and piled on top of the layer of stiff clay that the massive dredging had laid bare. Write the appropriate letters A-C in boxes 1-5 on your answer sheet. Choose your answers from the box below the diagram and write them in boxes 6-9 on your answer sheet. Choose your answers from the box below the summary and write them in boxes 10-13 on your answer sheet. When the new Chek Lap Kok airport has been completed, the raised area and the ...motorway... will be removed.'. Answer: Lantau Island//sea walls Locate and also by 11 construction workerscoastlinedump-trucksgeotextileLantau Islandmotorwayrainfallrock and sandrock voidssea wallstyphoons .